NOTE: The tour originally announced in April has been moved to March 22-28. The one week Tour March 22-28 will include an introduction to the history of Urbanism and Architecture of Havana, Cienfuegos and Trinidad, all of them listed as UNESCO’s World Heritage Sites. It will involve insights of the regeneration of Old Havana and one day tours by bus to two smaller historic towns, Trinidad and Cienfuegos. The tour shedule below is similar to our 2008 tour. Subject to changes. Morning 9:30 - 1:00 pm. 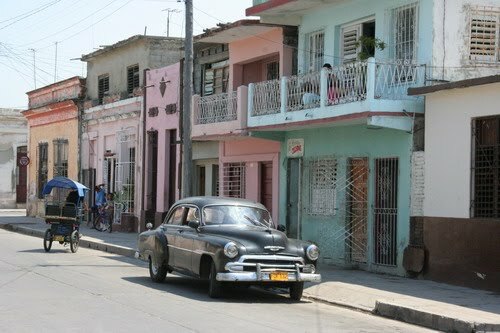 Trip from Havana to Cienfuegos. Accomodation. WALKING Tour of the Historic Center of Cienfuegos by Julio César Pérez and possibly Historiador Architect Irán Millán. Trip from Cienfuegos to Trinidad. Accomodation. Walking tour of the center of the city led by Julio César Pérez and possibly Historiador Nancy Gonzalez. Trip to the Sugar Mills Valley in Trinidad outskirts. 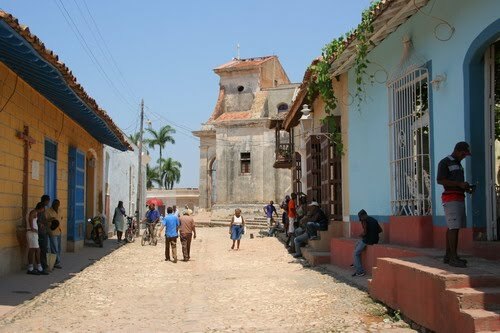 Visit Hacienda Iznaga and Tower Iznaga on the way back to Havana. Cienfuegos Yacht Club by the sea. Mr. del Castillo is an expert in the restoration and structural repairs of old buildings. He has recently retired from his position at the Office of the Historador of Havana, where he for many years has been working closely with the Historador Eusebio Leal Spengler himself, who is in charge of the restoration of Old Havana. Mr. del Castillo is a professor at the Havana School of Architrecture and he has been awarded the National Award of Architecture. He has lectured widely in both the U.S. and in Europe. Mr. Romero is an architect, expert in hotels and one of the advisors of the Minister of Construction of Cuba. Mr. Romero is a professor at the Havana School of Architrecture and he has been awarded the National Award of Architecture. He has lectured widely in Europe. Mr. Coyula is the former Director of Havana´s Planning Agency known as Grupo para el Desarrollo de la Capital. He is the former Director of the School of Architecture and the former editor of Arquitectura Cuba magazine. Mr. Coyula is a professor at the Havana School of Architrecture and he has been awarded the National Award of Architecture He has taught in MIT, Harvard and has lectured widely in USA and Europe. We will also try our best to arrange a meeting with the Historiador of Havana: Eusebio Leal Spengler. But we cannot promise that we will manage to set up such a meeting, alternatively we will meet other key staff at the Historador office such as Mr. del Castillo. We will also meet several people involved with restoration / preservation / heritage / and urban development in the other cities we visit. In Cienfuegos we will meet the Historiador and Head Architect of the town Mr. Irán Millán, and in Trinidad we will meet the Historiador and Head Architect of the town Mr. Nancy González. The cost of the tour programme is estimated at 1000 CUC (Cuban Convertible Pesos) for participants choosing to stay at Casa Particular (see under "Accomodation" below). This is a preliminary price estimate subject to changes in currency rates and our local costs on Cuba. The CUC is per Sring 2008 pegged in a relationship of 1 to 1,08 to the American Dollar, so 1000 CUC equals 1080 $. For two persons sharing a room the individual tour price is 900 CUC for the Casa Particular option. We can arrange accomodation for additional nights in Havanna if you arrive early or stay on (single or double occupancy). You can also choose to stay in a luxury hotel in Havana, against a surcharge. The price for the tour with hotel is 1500 CUC (single room) or 1400 CUC (double room, per person). This includes five nights in hotel in Havana, one night in hotel in Trinidad, and one night in Casa Particular in Cienfuegos. The participants are asked to arrange for their own travel to and from Havana. We are not a tour operator, but can mention the following airlines servicing Cuba from Europe: Air France, British Airways, Iberia, Virgin Atlantic (from London). To find the best rates we recommend a search on Kelkoo. If participants wish to stay longer on Cuba they are welcome to do so. Meals will be both collective and on an individual basis, but all meals will have to be paid locally by the individual participant. A few ATMs can be found in Havana. But ATM's are rare and expensive, and no cards issued by an American bank or it's subsidaries will be accepted. So it is strongly advised that you rely on cash for the trip. Euros, Pounds and Dollars are accepted in any currency change shop, although Dollars will be subject to a 10% tax when exchanged. Casa Particular is a uniquely Cuban form of accomodation, and is highly recommended for those who want to have a more personal experience during their trip. Most rooms are in appartment buildings from the 1950s in the El Vedado area of Havana, just a few blocks from Hotel Nacional where we can have breakfast, lunch, dinner, pool, gym, or simply drinks at any time. Many of the rooms have air condition, and each appartment has common areas such as living and dining rooms that are shared with the Cuba family living in appartment. If you want, the Cuban family will provide you with breakfast and other meals (against a small surcharge). All guests will have single rooms unless otherwise specified. Some bathrooms might be shared with other guests. The buildings are just 5 minutes away from the Malecón. We will stay in the same area as during our last two trips, the location has proven as a superb starting point for exploring Havana. The Casa Particular is included in our price offer. Alternative hotel accomodation: If you prefer international style and do not want to stay with a Cuban family, we can offer you alternative hotel accomodation in walking distance from our Casa Particulars, against a surcharge. We offer in our hotel option accommodation at the famous Hotel Nacional, one of the historical landmark buildings in Havana. It is located at the waterfront in a garden setting. Subject to availability of rooms. Hotel website: www.hotelnacionaldecuba.com. We will stay in private homes (Casa Particular). Not all the group will be accomodated in the same are due to the character of the city. We will split the group in two neighbourhoods, most of our guests will stay in old colonial houses close to the city centre while others will stay outside of the city centre in early modernist bungalows close to the sea. In most cases the rooms will have air condition, private bathrooms, etc., but standards may vary since we will live in private homes. Alternative hotel accomodation: If you prefer international style and do not want to stay with a Cuban family, we can offer you alternative hotel accomodation in Cienfuegos, against a surcharge. We offer in our hotel option accommodation at the Hotel La Union, located in the historical center of the town. Subject to availability of rooms. Hotel website: www.hotellaunion.com. We will stay in private homes (Casa Particular). This gives a unique insight into Cuban life and the opportunity to make some new friends. Some of the houses have truly spectacular interiors from the hight of the colonial time in Cuba, a true experience. In Trinidad we do not offer a hotel alternative, as the hotels are located far outside of the city centre. You will need a visa for visiting Cuba, please contact your local Cuban embassy. A tourist visa should be the simplest one to obtain. New regulations require you to provide the address and registration number of our Casa Particular when applying for a visa. We will provide you with this information in due time. The tour is organised by C.E.U. Norway - Council of European Urbanism, in collaboration with Moderno AS. We have a strong history of organising similar events in other countries, including Norway, Germany, the UK, Romania and Italy. Julio Cesar Perez is the author of a major new book on Cuban architecture and culture, "Inside Cuba", published byTaschen. He is the President of the Cuban Chapter of the C.E.U. and the author of "A Master plan for 21st century Havana".